ParkVia offers the possibility of booking low cost Alicante Port Parking with meet and greet services at Alicante Port. You can pick from open-air and undercover parking spaces in car parks located near the port. 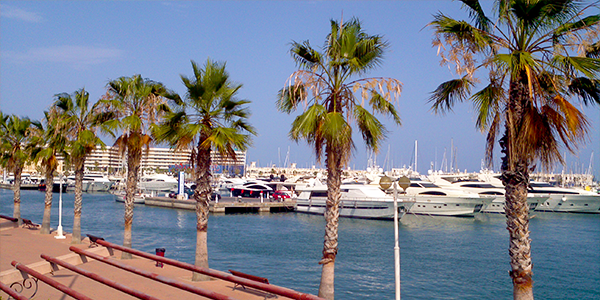 Booking your Alicante Port Parking is very easy. You can check availability for the dates and times you wish to park by entering this information into our search engine at the top of the screen. After entering your dates and times into the search engine you will be shown the car parks available for the dates and times required. You will be able to find out about the services offered by each car park by clicking on the 'Info' icon next to the car park logo. The price quoted is the total price for the length of stay requested. Once you have read the information about the car park all you need to do is click on 'Book' and complete the online booking form. With ParkVia you can book your Alicante Port Parking any time of the day or night from the comfort of your own home. If you have any questions you can contact our customer service line during office hours. Alicante Port is one of the major ports on Spain's Mediterranean coast thanks to the large volume of passengers and goods it handles each year. Many cruises have found this a great stopover option due to the location of the port right in the city and the great variety of choices available to travelers.